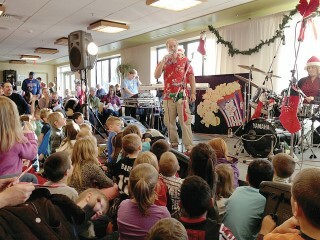 Children’s singer-songwriter Rick Charette and his Bubble Gum Band return to Saint Joseph’s College of Maine's Standish campus on Sunday, December 2 at 2:30 p.m. for the 28th Annual Holiday Benefit Concert. The public is invited to join the College community for this family-friendly afternoon of music taking place in Pearson’s Café in Mercy Hall. As in past years, concert-goers are asked to bring a new, unwrapped toy as the price of admission. Additionally, donations are welcomed and encouraged. All items and money raised will go to benefit children of Sebago, Raymond, Standish, and Windham in need of some holiday cheer. For more information about the concert or the Mercy Center at Saint Joseph’s College, contact Kathryn Cody at 207-893-7794 or kcody@sjcme.edu.